I have an alternate email that I use as a backup email. At one point, my main email was really messed up and I used the alternate email exclusively while I straightened it out. During that time I joined Pinterest, set up the Frugal Fish Facebook page, and started following, “The Inspired Room” blog. I learned about “The Inspired Room” when they won the best decorating blog award from Better Homes and Gardens. After reading one post, I was hooked. She recently moved and we were walked through the process with her. She told of their house hunting and showed a video of the home they chose. Reading their posts is like talking to a next door neighbor. Of course, my hero will always be Mary Hunt of debtproofliving.com. I started reading her newsletters when they had to be mailed using snailmail! Little by little, her advice and online calculators helped us get out of debt and build an emergency fund. I was especially grateful last winter when my husband was laid off for 3 months! Recent California wildfires serve as a grim reminder of how quickly ones personal economy can change. If the rain of an economic downturn were to fall on you tomorrow, would you know how to find shelter from the storm? debtproofliving.com. She is also transparent, sharing her failures as well as her successes. No one is perfect and it is nice to see an expert admit a mistake. Mary is my hero and Marla Ciley of flylady.net is my favorite aunt. I almost said she was like a grandma to me, but she is way too young! She is a mentor and cheerleader that helps you get your home out of C.H.A.O.S. (Can’t Have Anyone Over Syndrome). 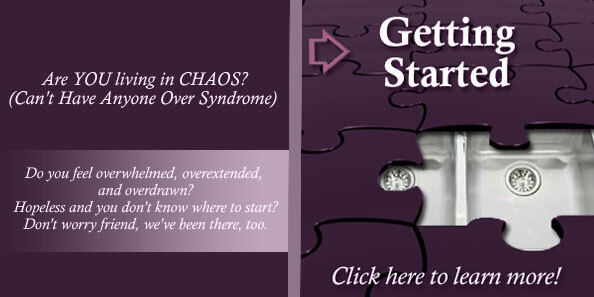 She helps you establish routines that gets every area of your life back under control. Your home is never finished. It is a work in progress as your life changes. My nursery is now my office and in 10 days our youngest will graduate. School days will finally be over!